Brexit 2. Twenty seven circles of graduated shades of yellow, overlapping in to one cohesive circle, with a tea-dyed Union Jack hanging off the bottom, obscured by threads of black and white. circle and yellow thread around outside. It is flat, but my phone camera is acting up in many odd ways. This is very different from my original sketch, but the overlapping circles appeared very early on in the construction phase, and they seemed to say more about cooperation than the original, radial design. If you need to escape from the impending disaster, enter the land of fantasy and go to see Dior, Designed of Dreams. Tickets are available from May, and it is on until July. Photography and sketching are permitted. Thanks Shirlee. I have booked to go to the Dior again in May, as I think my spirits will need another lift by then! 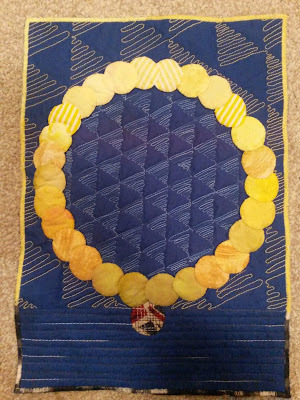 That’s a great design and I love the quilting! Thanks for your comment. I love to read them, but can't always respond. I'm a scientist, stitching fan, mother ( boys plus dog), wife, sister, friend, daughter, wannabe fabric artist; usually all in the same day.